Even residents who don’t drive will still feel right at home at Parvis. A pedestrian gate leads down to Chip Bee Gardens, a short 5-10 minute walk to Holland Village, where you have full amenities including Holland Village MRT station, 24-hour Cold Storage supermarket, several bus services, a taxi stand, at least 7 different banks, cafes, bars, restaurants, boutiques… In other words, ultra convenience. 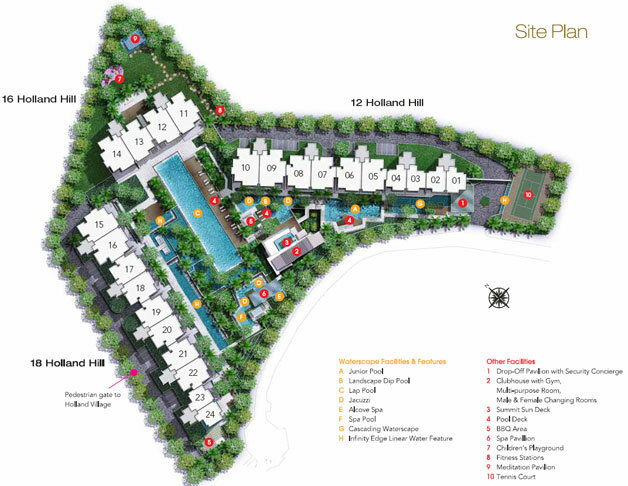 And if you do need to leave the neighborhood, there’s easy access to both the Pan-Island Expressway and Ayer-Rajah Expressway via Farrer Road. Orchard Road is a mere 10 minute drive away, with the scenic Botanic Gardens and the Dempsey Hill dining enclave along the way. Moving on to the units themselves, Parvis definitely caters to those who desire (and are able to afford) luxury living. Excluding ground floor (level 2) units and penthouse units, the 2-bedders are 990 sft, 3-bedders are a generous 1,701 sft (a welcome change from the usual 1,200-1,500sft 3-bedder) and the 4-bedders are 1,991 or 2,013sft ( just a slight difference in the master suite bathroom). Layouts are squarish and efficient,with no awkward corners or pillars. 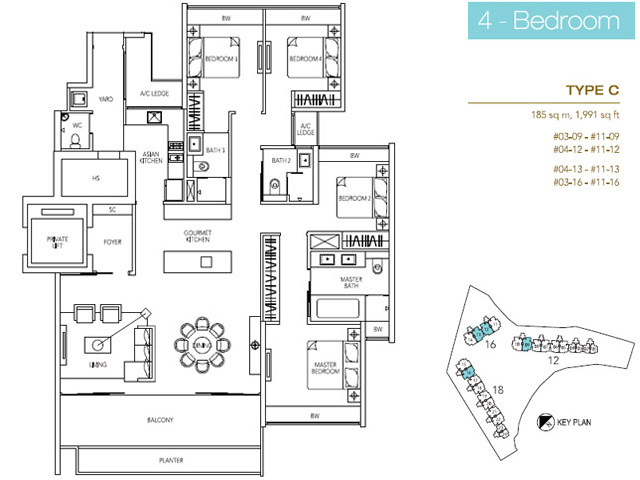 The 4-bedders have proven popular, just take a look at the floor plans & you’ll appreciate the practical layouts. The three blocks are arranged in a rough V-shape around the main condo grounds, so all living room balconies enjoy a view of either the main lap pool,the junior pool, or the landscape pool. I liked that each unit had a single, highly usable balcony. This is in contrast to certain projects that have separate balconies at living room and master/common bedrooms – the total square footage of balcony space might be fairly similar, but once you slice it up into 2-3 separate balconies it becomes far less usable. I would say privacy is a recurring theme at Parvis, and this is an increasingly valuable commodity given we live in a land-scarce city state. The huge grounds make it possible for the 3 single-loaded blocks to face each other at very comfortable distances. The terrain and surroundings also ensure that it is unlikely that views from the outward-facing windows ( that is windows that don’t look onto the main Parvis grounds) will become obstructed. (The view of neighboring Holland Residences from the common bedrooms of block 16 isn’t particularly attractive, but neither is it overly imposing since the latter development is a mere 5 floors high and set on lower ground.) Regular party hosts will enjoy the many options available for entertainment purposes, while those who prefer peace and quiet will appreciate how the grounds and facilities are designed to give party hosts privacy while minimizing disturbance to other residents. Last but not least, each unit is served by a private lift. I often lament that new homes these days just aren’t as well-built and thoughtfully planned as those of yesteryear, but Parvis is certainly one development that bucks the trend. ← Sixth property cooling measure: What’s the impact on you?